Born to Harry and Ethel (Squier) Brown on May 18, 1923, Gilbert was the third of three children. He spent his formative years living and ranching in Willow Creek. Gilbert married Glenda Rae Holfeltz on January 30, 1950. They were later blessed with two daughters, Sue and Joan. Gilbert (“Gib”) was a hardworking man who served his country as a member of the United States Army 63rd Infantry in Korea. After working for a few years with Utah Power, he and his parents purchased and operated The Corner Store at 500 W 100 S. He enjoyed the hard work and associations during the nine years of running the store. In 1960 they sold the store and Gib went to work for American Gilsonite as a warehouse and office manager. He retired from American Gilsonite / Chevron in 1983. Gib loved working on any project, keeping a crisp yard, and generally working hard. He was quite meticulous about things and enjoyed seeing a project well done. For many years Gib was a great square dance caller and dancer. 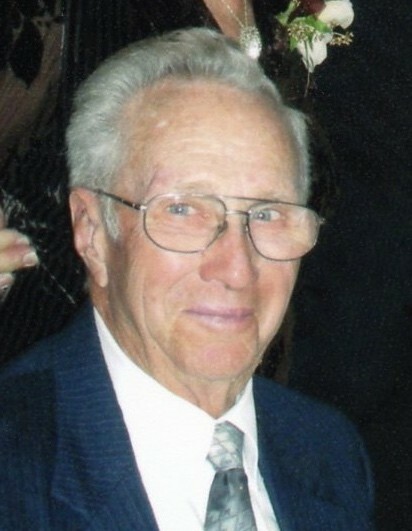 He later became an avid golfer and spent many cherished moments on the golf course with his family and dear friends. After retirement, Gib and Glenda began spending winters in Arizona. They loved their time and many friendships established there. Gib is survived by his wife of 68 years, Glenda Rae; two daughters; Sue Brown of Vernal, and Joan Eisenhauer (Roger) of Caldwell, Idaho; three grandkids, and four great grandkids. He is preceded in death by parents Harry and Ethel Brown, brother Harry Jr. (“Bud”), and sister Phylis Warby. Our family would like to thank the staff of Canyon Health Care; Kim, Janice, and Joe for their support and compassionate care. Funeral services will be conducted on Wednesday, April 11, 2018 at 11:00 AM at the Blackburn & Sons Vernal Mortuary viewing one hour prior to the services at the Mortuary. Burial will be in the Vernal Memorial Park, Military Honors will be provided by American Legion, under the direction of the Blackburn and Sons Vernal Mortuary and Cremation Care. Send condolences on line click on the photo go to our Tribute Wall you can add photos or check locations, all online at our Website at www.blackburnvernalmortuary.com.